Goudhurst is a pretty village, known for being one of the highest locations in Kent. 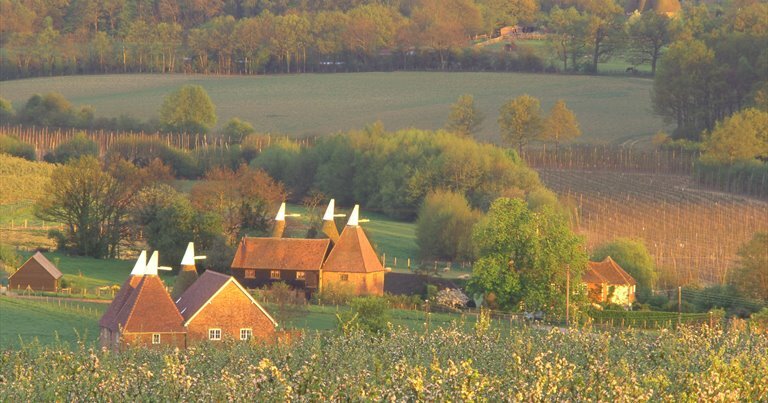 The countryside surrounding the village is sprinkled with Oast houses, so no surprises we put it top of our list! The Goudhurst Inn is located in the Hush Heath Estate which is famous for its production of English wine and cider, and the pub even has rooms upstairs should you overindulge in the apple nectar and need a reviving snooze. There’s a great AA 3 mile walk which spans the village and offers fantastic views of the Weald – highly recommended for a sunny day! Royal Tunbridge Wells is one of the most popular Kent towns, with plenty of shops, entertainment for families and even the Ivy Restaurant chain have landed in the High Street. Head just a few miles out of the centre and you’ll find the pretty village of Langton Green. A classic English pub with a huge garden, it’s the perfect location to park up and head out for a stroll before enjoying a hearty meal. We’ve found a scenic 4 mile walk which begins from The Hare and takes you on a circular ramble which passes through the majestic Groombridge Place with it’s 200 acres of manicured land. Priding themselves on a menu curated around fresh, local and organic produce, the Tiger Inn is a firm favourite with both locals and visitors to the village of Stowling. Log burning fires and being surrounded by picturesque Kentish scenery makes the Tiger a great base for a stroll, and we’re ramping things up a little with a brisk 9 miler, which will certainly stoke your appetite for a meal after! If cycling is more your bag, may we suggest taking a trip to Dargate, where you can begin your ride from the popular Dove Inn and explore the nearby Victory wood and the hamlets of Hernhill, Yorkletts and Boughton. Eating at the Dove Inn is a real treat, and they do a mean pizza – perfect for post-exercise carb-fest. A Grade II 16th century pub, built in 1520 and boasting a wealth of original features and Inglenook fireplace, The Rock Inn is a local favourite. Located in the small hamlet of Chiddingstone Hoath, there’s often more horses than motors in the car park due to to the rural area! History buffs will be in their element as the walk we recommend takes in the historic sites of Hever, Penshurst place and Chiddingstone itself, not to mention oodles of Oasts – all in just 4.5 miles! Under relatively new management, The Greyhound offers light pub food using locally sourced ingredients and a friendly atmosphere for locals and visitors alike. There’s plenty to explore in this beautiful part of the Kent countryside, but if you’d like to incorporate a touch of history and literature into your ramble, why not try the ‘Jane Austen & Tonbridge Walk’ which takes in the family connections of the famous author, and also visits Tonbridge Castle. The pub is a short drive from Tonbridge and the perfect location to discuss your adventure over a cold pint. Get in touch and let us know if we’ve missed any of your favourite Kent pub walks.